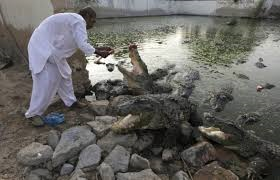 KARACHI, Oct 15: The lean days appear to be over for Mor Sahib, an 87-year-old crocodile venerated by Pakistan’s tiny Sheedi community, as pilgrims once again flock to a shrine in Karachi that has been shunned for years amid fears of Taliban attacks. The ageing reptile, his leathery skin fissured by time, waddled out of the murky water towards a crowd of visitors wearing garlands, all hoping to lure him with handfuls of sweets and choice pieces of goat neck. The pilgrims are Sheedis, whose ancestors came from Africa and are drawn from different sects, making them a potential target for hardline militants. Their new-found confidence coincides with a major crackdown on crime and militancy by paramilitary Rangers in the port city of 20 million people where the shrine is located, which has seen murder levels drop sharply. The military has also been carrying out a major offensive against the Taliban movement in the northwest of the country since June, 2014, and its pursuit of militants gathered pace following the massacre of 134 school pupils in December. “Three, four years back, armed Taliban had become so influential that police were afraid of them … at the nearby police station they killed 18 policemen,” said shrine caretaker Mohammed Yaseen, light glinting off tiny mirrors stitched into his traditional cap. Yaseen recalls when displaced ethnic Pashtuns fleeing fighting in northern Pakistan began flooding into Karachi after 2008. Among them were Taliban sympathisers whose interpretation of Islam had no place for crocodiles, around 100 of which inhabit the shrine’s pond. The site closed for 10 months in 2010 and a charity fed the crocodiles in secret. The shrine quietly reopened in 2011, but only a handful of worshippers dared to come. Gradually, improving security meant 100 people might turn up on a busy day last year. Now crowds of more than 1,000 flock to the shrine several days each week. The drop in violence has also raised Sheedi hopes that they might hold their annual four-day festival before the end of the year. It has been cancelled for the last five years for fear of attack. At the autumn celebration, four Sheedi communities slaughter goats and dance to a drum beat before the crocodiles, who are showered with rose petals and anointed with perfume and saffron. “This year we are planning to hold the festival, so our young generation comes to know about our traditions,” said Yaqoob Qambrani, chairman of the Pakistan Sheedi Alliance. While there is no reliable data available, estimates of the number of Sheedis in Pakistan vary widely from tens of thousands to a few million. The community believes the crocodiles living in the shrine’s pond are the disciples of saints. A wrinkled man at a wooden kiosk sells worshippers rose petals and other offerings. At the inner entrance to the shrine hall, a bearded man in a small black cap blessed pilgrims by patting their heads and shoulders with peacock feather quills. Among them was driver Mohammed Arif, 30, and his three children, whose bright, freshly starched clothes shone in the gloom. “My father used to bring me to this shrine, now I am bringing my children,” he said happily.